v5: Now Supporting Audio Units! Channel G Compact features calibration modes for music, post production, and models of the world’s most popular analog mixing desks. The Channel G Compact user interface seamlessly integrates with the Digidesign D-Control and D-Command control surfaces, as well as the Venue D-Show and Profile live sound consoles. The ML4000 is a high-resolution limiter and multi-band dynamics processor designed for music, mastering, post, and live sound. The ML1 mastering limiter uses a flexible brick wall look-ahead design coupled with multiple stages of limiting for superior peak detection. The unique Knee and Mode controls allow the ML1 to handle any kind of material with a variety of responses ranging from transparent to aggressive. The ML4 multi-band dynamics processor includes a 4-band Gate, Expander (upwards or downwards), and Compressor fed into the same limiter algorithm found in the ML1. Each band’s Gate, Expander, and Compressor can be configured separately or linked together. Steep 24 dB/Oct crossover filters minimize signal leakage into adjacent bands. Multiple real-time metering options in each band allow quick visualization of all signal dynamics. The ML4 crossover page shows the overall frequency response in real-time of the input, output, or total dynamics effect, on top of the graphically adjustable crossover frequencies. Accurate output adjustment is fast and simple with output ceiling control, large meters, and meter level text readouts. The ML4000 provides outstanding results with an intuitive user interface, flexible design, and powerful set of algorithms. McDSP Native and LE plug-ins are compatible with Pro Tools™ HD, HD Accel TDM systems, as well as Pro Tools™ LE and Pro Tools™ M-Powered host based systems. McDSP plug-ins support Mac OS 10.4.x (Tiger), 10.5.x (Leopard), 10.6.x (Snow Leopard), Windows XP, and Vista and require Pro Tools 7.x, 8.x, or greater. McDSP plug-ins require an iLok USB Smart Key. McDSP plug-in Mac versions are Universal Binary, compatible with both Intel and PowerPC based computers. McDSP plug-in Windows XP versions require an Intel Pentium 4 or greater processor. 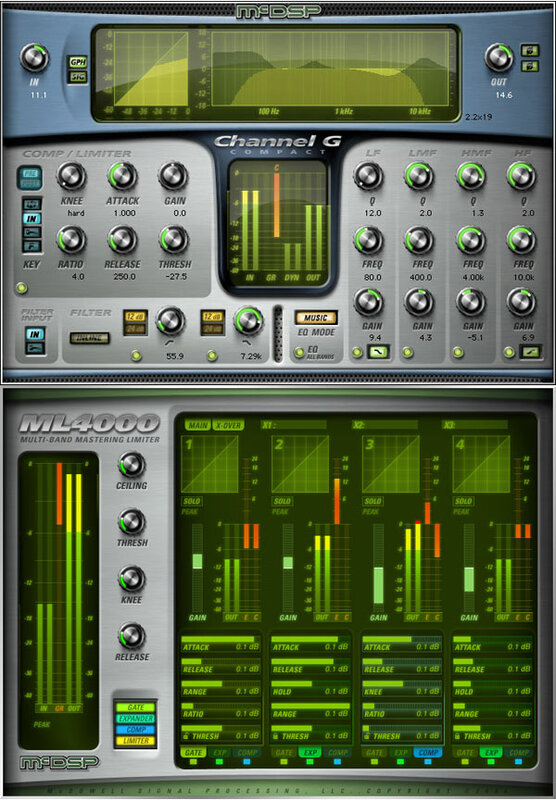 McDSP plug-ins are available in RTAS and AudioSuite configurations. See individual products for specific available configuration sets. Pro Tools™ 7.x, 8.x, or higher is required for LE and M-Powered systems. Additionally, a third party software application that supports the Digidesign TDM, RTAS, or AudioSuite plug-in standard may be supported. McDSP plug-ins are compatible with the entire Pro Tools™ 7 and 8 product line. McDSP plug-ins support any Digidesign or approved third party hardware supported in Pro Tools™ 7.x or Pro Tools™ 8.x. This includes HD, HD Accel, 003, Mbox 2 Pro, Mbox, and M-Audio hardware. All McDSP HD plug-ins, except Synthesizer One, also support the Digidesign VENUE D-SHOW systems.